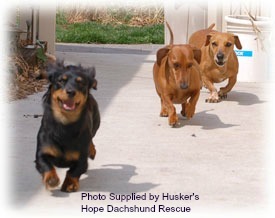 Dachshund Rescue Centers and Adoption Groups. ...recover strayed lost or stolen dachshunds and to keep them, out of the grips of animal dealers, laboratories, puppy mills and also out of animal pounds. These groups do an important job of finding homes for many unwanted dogs in need of families to love and care for them. Often people think that dogs that are up for adoption may be difficult or have problems so their owners don’t want them, but more often it is the owners that have the difficulties not the dogs. Why many dogs need new homes. Their owner can no longer afford the care and feeding of their dog. Death of the owner or perhaps the owner is too old to care for them any more. Family break up and nobody will take the dog. Couples have new baby and cannot cope with the dog and baby. Owner moves to an apartment that does not allow pets. Change of circumstances for breeders or owners. How much will it cost to adopt a dog. Most groups offering rescue and adoption facilities are non-profit making and rely on fund raising and donations to survive, they are always most grateful for any contributions. When adopting a dog there will be a charge of approximately $150 - $350, usually depending on the age of the dog, this goes towards paying for the care, feeding, neutering, vaccinations, worming, and special attention the dogs may require, as some arrive in poor condition and require veterinary attention. Approval is required for adoption. Rescue Centers will check that you can provide a suitable home for a dachshund and are aware of the long term commitment of owning a dog, some centers will visit your home. You will need to complete an application to be approved for dachshund adoption. Where to find Rescue Centers. Some of the many rescue groups available check the web or your local phone directory. If you would like to rescue a Dachshund dog or puppy and adopt them into your family contact your, nearest Doxie Rescue/Adoption organisation.